Decent Video Gets Cheaper & Cheaper. Here’s a $25 SD demo. Wanna make some noise? There’s an app for that: Linear Time Code. JumpStart LTC generates a Longitudinal Time Code audio signal. It provides a convenient interface for setting dedicated timecode devices (deneke, sound devices, zaxcom, etc). iPhone 4’s 960×640 pixel screen as camcorder monitor? A lot has been said about the iPhone 4 screen’s incredible resolution. Apple v. Adobe. – FCS v. CS5. – The choice is pretty clear. Adobe has really been pushing the limits when it comes to what the software package can do. From CS3, which was nice, but had a few carryover PC apps from a recent purchase, to CS4 which broke new ground in terms of authoring DVD’s for Flash, video in a PDF, and more. Now CS5 jumps a whole new direction with 64-bit ONLY computing. This cuts some old computers off, but with a decent system, you can access tons more RAM. Add to this the new Mercury Engine using GPU to handle video processing and you can handle multiple streams of heavily compressed video where one stream used to choke a computer. Specifically I mean H.264 and AVCHD, which seem to becoming defacto standards in tapeless acquisition these days. Apple lays off 40 from FCP team, before NAB? 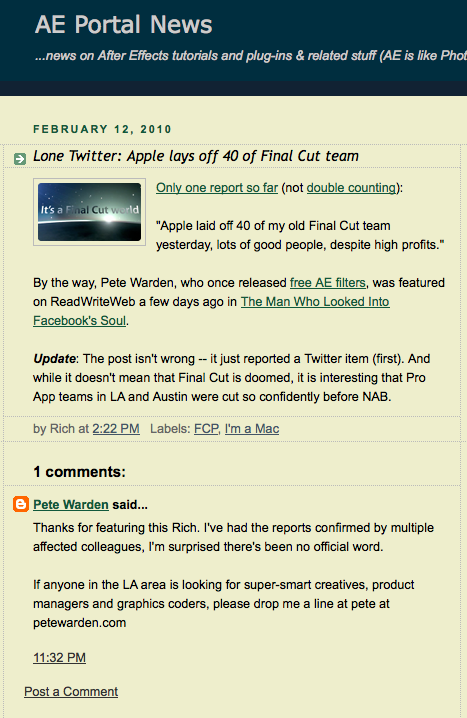 Apple laying off 40 people from the Final Cut Pro software team has been noted on Twitter, but not corroborated anywhere else as I can find. But if the layoffs are actually true, it begs us to wonder what Apple’s long term dedication is to high-end computers, and professional apps— especially considering that the vast majority of profits come from: iPods, iPhones, iApps, iMacs, iBookstore, iTunes music & TV shows, laptops and soon- iPad. This week, Tech pundit David Pogue make some excellent points about Apple’s new endeavor to provide Microsoft “Exchange for the rest of us” with Apple’s new MobileMe service. Not only did they give former .Mac subscribers the option to NOT take part in this new service and keep other service that are no longer offered, but Apple has had interminable problems with the new service. One step forward – two steps back. As reported by AppleInsider, Apple’s iPhone 2.0 software enables secure erasure of your personal data, however, it also moves Apple away from iSync compatibility and into their own little cloud of interoperability. Chat Much? Is it secure? Declan McCullagh has a great overview of the security of Chat. And by chat, I mean computer and cell phone instant messaging. Are you wireless, and is the wireless connection secure? If you are wired, was there a secure log on? Does it provide complete encryption? Cell Phone Security- is NOT! As I mentioned back in December, your life on a cell phone is not as secure as we would like it to be.